After James VII of Scotland was deposed, there were a series up uprisings aimed to restore the Stuarts to the throne of England and Scotland. James' throne had been usurped by his daughter Mary and her husband William of Orange. In 1689 'Bonnie Dundee' raised the Jacobite Standard on Dundee Law (a hilltop), and received support from 200 Irish troops arriving at Kintyre, and from Highand and Lowland Scots with Catholic and Episcopalian links (the Church of Scotland was aligned to the English powers). This charge worked at the battle of Killiecrankie in 1689. Haughs of Cromdale in 1690, and Mackay constructed Fort William as a new defence. In June 1690 the jacobites learned of William's victory over James at the Battle of the Boyne. Jacobite hopes were dashed. A year later they were forced to agree to a truce while the Clan chieftains sent requests to the exiled James for permission to submit to William. In January 1692 the Jacobite Clans formally surrendered to the government. The War of the Austrian Succession drew Britain and France into open hostility in 1743. It was to be a surprise attack with troops marching from their winter quarters to hidden invasion barges which were to take them and Charles Edward Stuart (later known as Bonnie Prince Charlie or the Young Pretender - see left) to Maldon in Essex where they were to be joined by local Tories in an immediate march on London. One of the worst storms of the century scattered the French fleets which were about to battle for control of the English Channel, sinking one ship and putting five out of action. The barges had began embarking some 10,000 troops and the storm wrecked the troop and equipment transports, sinking some with the loss of all hands. Charles was officially informed on February 28 that the invasion had been cancelled. However, despite such success, all was not well. The promised French and English support did not materialised. Wade and Cumberland were now approaching. A militia was forming in London. On December 6th the Jacobites began their retreat. The French received news of the retreat and so cancelled their now-ready invasion. By Christmas the Jacobites forced the city of Glasgow to re-provision them. They left to seize the town of Stirling in January, and on January 17th around 8,000 Jacobites approached General Henry Hawley at the Battle of Falkirk and routed his forces. They turned north and took Fort Augustus and Fort George in Inverness by early April. On April 16th 1746 they were finally defeated near Inverness at the Battle of Culloden by Hanoverian forces under the command of the Duke of Cumberland. Charles fled to France making a dramatic escape disguised as a 'lady's maid' to Flora Macdonald. Feb 6 1685 Charles II of England died and was succeeded by his brother, James II, a Roman Catholic. Charles II became a Roman Catholic on his deathbed. Apr 23 1685 James II is crowned King of England and Scotland (James VII of Scotland) in Westminster Abbey. James Francis Stuart born. In honour of the "Old Pretender", this is known as "White Rose Day" in Jacobite circles. November 5 1688 William of Orange landed in South-West England. December 23 1688 King James VII deposed and fled, dropping the Great Seal into the river Thames. January 22 1689 William of Orange and Mary become joint sovereigns of the UK. March 18 1689 Earl of Leven raises a Border regiment to hold Edinburgh against the Jacobites. It later becomes the King's Own Scottish Borderers. April 4 1689 Scottish Parliament declared that James VII had forfeited the Scottish throne. April 19 1689 Earl of Angus forms the Cameronians into a regiment. July 27 1689 Battle of Killiecrankie in which Viscount Dundee (John Graham of Claverhouse) leading a force of Jacobite Highlanders overcame the forces of King William, led by General Hugh Mackay. Viscount Dundee was killed leading the charge. August 21 1689 Battle of Dunkeld when the newly formed Cameronians defended the town against 3,000 Highlanders. May 1 1690 Battle of Cromdale, Jacobites defeated by government troops. June 7 1690 The Scots Parliament ratified the establishment of a Presbyterian religious system, rejecting Episcopacy. July 12 1690 William III defeated James VII in the Battle of the Boyne, Ireland. February 13 1692 Massacre of 38 of the Clan Macdonald by government order at Glencoe. September 6 1701 Deposed King James VII died at Château de Saint Germain-en-Laye, near Paris. March 8 1702 King William III died and Queen Anne acceded to the throne at the age of 37. She was the daughter of King James VII. August 5 1704 Act of Security passed by the Scottish Parliament. This allowed Scotland to choose a successor to Queen Anne, other than the one elected by the English Parliament, if Scottish conditions were not met. This precipitated the demands in London for an Act of Union of the two parliaments. October 3 1706 Last Scottish Parliament in Edinburgh before the Union with Westminster. January 8 1707 Earl of Stair, held responsible for the massacre of Glencoe, died. January 16 1707 Treaty of Union of Scottish and Westminster Parliaments ratified. March 25 1707 Last meeting of the Scottish Parliament in Edinburgh - until 1999. May 1 1707 Act of Union of English and Scottish parliaments proclaimed. August 1 1714 Death of Queen Anne; George I, Elector of Hanover becomes king. September 6 1715 The Earl of Mar unfurled the standard of the "Old Pretender" at the start of the 1715 Jacobite Uprising. November 13 1715 Battle of Sheriffmuir in which a force of Jacobites led by John, 6th Earl of Mar, fought an inconclusive battle against a Hanoverian force led by John, 2nd Duke of Argyll. December 22 1715 James Stuart, the Old Pretender, arrived at Peterhead. He stayed for only a few weeks. February 4 1716 Prince James Francis Stuart, the Old Pretender, left Scotland after a stay of only three weeks, effectively bringing the first Jacobite Uprising to an end. June 10 1719 Battle of Glenshiel, Jacobites with Spanish assistance, and government forces clashed. September 1 1719 Marriage ceremony of Prince James Francis Edward Stewart (the Old Pretender) and Princess Maria Clementina Sobieska. The Polish Princess had been kidnapped on her way to the original wedding, escaped and had married James by proxy earlier in 1719. December 31 1720 Charles Edward Stewart born in Rome. 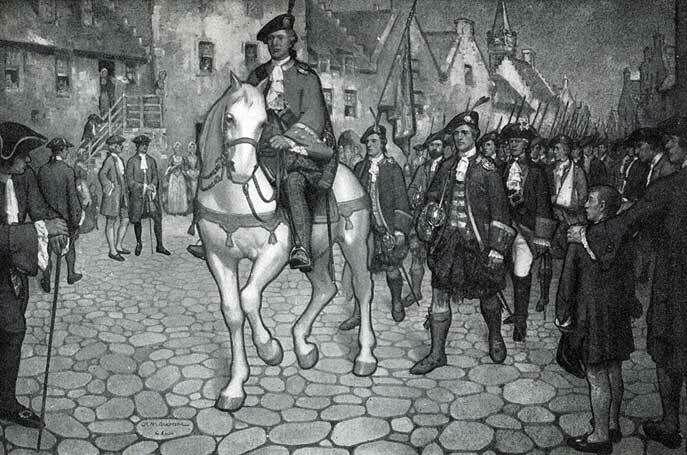 May 12 1725 The Black Watch regiment was commissioned under General Wade to police the Highlands. June 10 1727 Death of King George I and accession of George II. December 28 1734 Rob Roy McGregor died. July 23 1745 Charles Edward Stuart lands on Eriskay in the Outer Hebrides at the start of the Jacobite Uprising. August 19 1745 Charles Edward Stuart, raises his standard at Glenfinnan, at the start of the '45 uprising. September 3 1745 Prince Charles Edward Stuart proclaimed his father as King James VIII of Scotland at Perth. September 14 1745 Bonnie Prince Charlie, Charles Edward Stuart, occupied Edinburgh. September 17 1745 Prince Charles Edward Stuart took up residence at the Palace of Holyroodhouse, Edinburgh. September 21 1745 Charles Edward Stuart victorious at Battle of Prestonpans. The Jacobite army of just over 3,000 under Bonnie Prince Charlie heavily defeated the English Royal forces led by Sir John Cope. December 6 1745 Charles Edward Stewart's entry into Derby. January 16 1746 Retreating Jacobite army defeated Hanoverian forces at Battle of Falkirk. February 16 1746 An attempt to capture Prince Charles Edward Stewart at Moy Hall was unsuccessful and the government forces were surprised and routed by a handful of Jacobites. Duncan Bam MacCrimmon, Hereditary Piper to the MacLeods of Dunvegan, fighting on the Hanoverian side, was the only fatality in the skirmish. 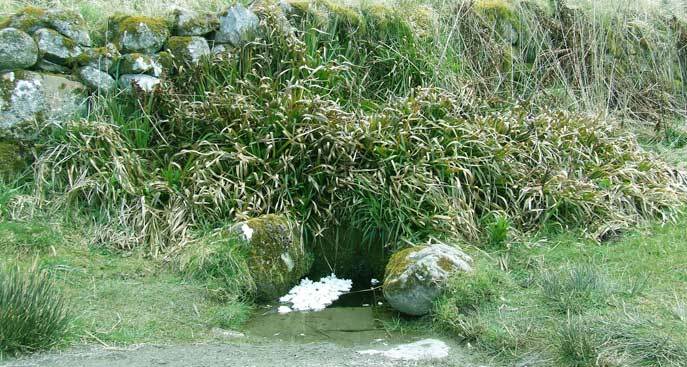 March 17 1746 Lord George Murray and Cluny Macpherson (chief of the clan) fell upon the Campbell militia posts in the Braes of Atholl, at the head of Strathtay, and wiped them out. A brilliant feat of arms, it aroused a blaze of Jacobite optimism. 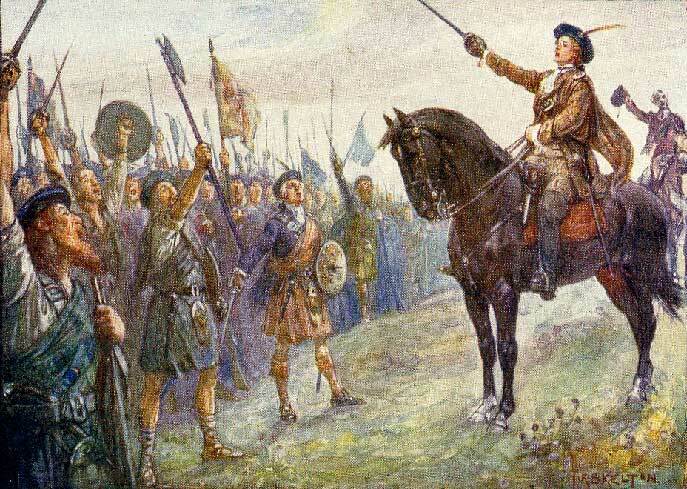 April 16 1746 Charles Edward Stewart defeated at Battle of Culloden. April 21 1746 City of Glasgow held a cake-and-wine banquet to celebrate the defeat of the Jacobites and offer the Duke of Cumberland the freedom of the city. June 18 1746 Flora MacDonald met Prince Charles Edward Stuart and persuaded him to wear women's clothes as part of the escape plan from the Outer Hebrides to Skye. July 5 1746 British Linen Company (later Bank) received its Charter. September 20 1746 Prince Charles Edward Stuart escaped capture by sailing to France aboard the French ship "L'Heureux." 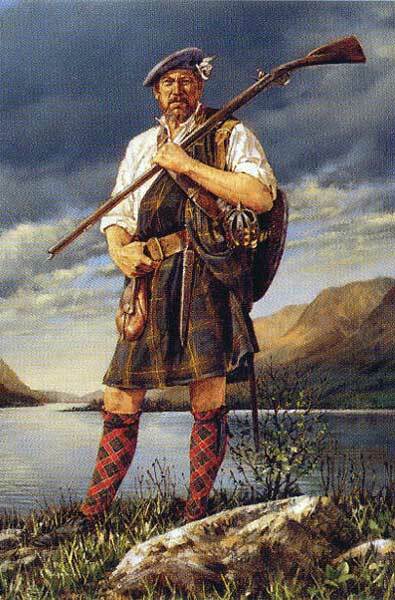 August 1 1747 Proscription Act introduced, banning tartan and the carrying of weapons. May 14 1752 Colin Campbell of Glenure, known as the "Red Fox", and a notorious presecutor of Jacobites after Culloden, was shot in Appin. Alan Breck (later made famous in Robert Louis Stevenson's "Kidnapped" and "Catriona") was accused (though no evidence was ever put forward) and fled to France. James Stewart (a friend of Red Fox) was arrested and was found guilty, despite a lack evidence, by a jury in Inveraray, presided over by the Duke of Argyll. October 26 1760 George III crowned, beginning a 60 year reign, one of the longest in British history. January 1 1766 James Stewart the "Old Pretender" died. July 1 1782 Proscription Act Repealed, thus allowing again the wearing of tartan and the carrying of weapons (banned as a result of the 1745 Uprising in support of Bonnie Prince Charlie). January 31 1788 Charles Edward Stewart, "Bonnie Prince Charlie" died.